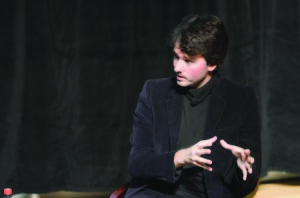 The Stanford Arts Institute held the third event of its Fashion at Stanford Series on Feb. 4, hosting a conversation with Berluti CEO Antoine Arnault that spotlighted luxury. Berluti’s appearance followed two earlier talks that focused on fashion, retail and image making, by Ron Johnson on Dec. 2 and Annie Leibovitz and Pascal Dangin on Jan. 9. Berluti, a leather goods and shoes brand, is part of the Paris-based luxury goods conglomerate LVMH Moët Hennessy Louis Vuitton S.A., of which Arnault’s father, Bernald Arnault, is chairman and CEO. The younger Arnault has also served as director of communications for Louis Vuitton and, in 2013, became president of Loro Piana. Arnault went on to describe the intimate relationship between luxury and time. Arnault highlighted his dedication to time and tradition by emphasizing not only how LVMH’s brands are exclusively manufactured in Italy and France, but also how consumer and societal whims do not compromise the essences of the brands. When several audience members inquired about Berluti and LVMH’s position on the growing overlap of technology with fashion and wearable technologies, Arnault insisted that the brands would not get involved with the nascent field. “We need to focus on what we know to do best, and our domain is the highest quality in luxury products and spending the most attention on uncompromising quality, not on being technologically advanced,” he said. Arnault concluded on an optimistic note in assessing the future of luxury brands in America. Contact Sarah Salameh at ssalameh‘at’ stanford.edu.